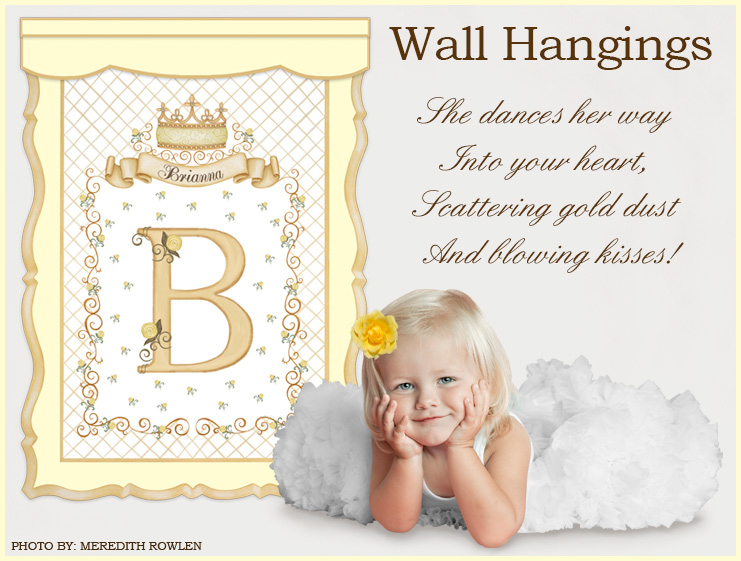 A beautiful decorative statement for a child’s nursery, bedroom, or play area, Dish and Spoon Productions’ canvas wall hangings are one-of-a-kind heirloom-quality keepsakes. Rich in color and detail, whimsy and sophistication, each original design is reproduced on museum-archival canvas using the giclée method of fine art printing. To preserve the integrity of the artwork for years to come, the surface of every canvas is glazed with a UV protective finish. Custom-made upon order and hand-crafted in the USA, each wall hanging is individually trimmed by hand to bring to life the intricately detailed edges of the canvas. Many designs are hand-embellished with materials such as Midori satin ribbons, Swarovski crystals, and iridescent opal fairy dust glitter. For the customer who wants a specific decorative look, custom color matching is always an option. Personalization is also available on all of our designs for no additional upcharge. Each wall hanging is signed by the artist and includes a dowel, hand-painted finials, and Midori satin ribbon for hanging. Optional hand-painted toppers, made of green-certified wood, enhance each gorgeous rendering. Velcro tabs on the back of each wall hanging ensure a close fit to the wall. Our wall hangings are available in multiple sizes. See individual product descriptions for details. Finished products ship within 2 to 3 weeks from receipt of order.